This kit contains; 14 count blue Zweigart Aida, pre-sorted stranded cottons, needles, stitch diagram and instructions. Finished size 44 by 12cm. 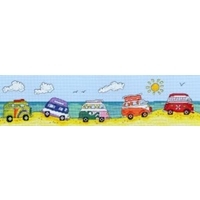 This kit uses full cross stitches, a few fractional cross stitches and back stitch.